BETA’s début at Land Rover Blair Castle International Horse Trials as part of the trade association’s 40th-anniversary celebrations was hailed a great success. During the event, BETA supported the Scottish Grassroots Eventing Festival, organised the Best Stand Awards and hosted a well-attended Tradestand Holders’ Drinks Reception. 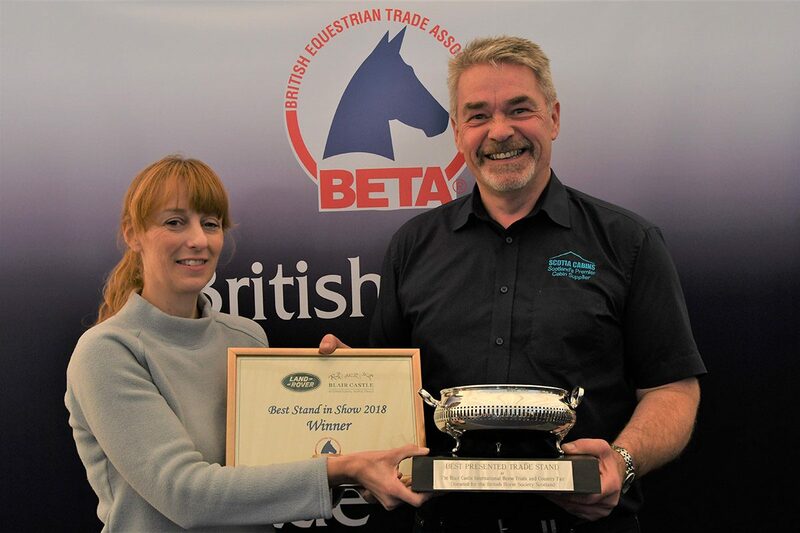 The Best Stand Awards competition was divided into three categories – Equestrian & Saddlery, Lifestyle, Pet & Fashion and Food & Beverages, with each stand judged according to BETA’s set criteria and awarded either a gold or silver standard. This year the emphasis was very much on customer service and the passion shown for their products. In Equestrian & Saddlery, Treehouse Sporting Colours and TopSpec Equine were awarded gold, while silver went to Just Chaps, Baileys Horse Feeds and Libby’s International. In the Lifestyle, Pet & Fashion section, gold was won by Scotia Cabins, which also won Best in Show, Equafleece, Carl Scarpa and Grays, with silver going to Massage Cushions, Rugby Plus and Ruff & Tumble. Food & Beverages saw gold go to Aelder, The Gin Bothy and Clootie Dumpling.